Perfect fit, great quality, comfortable, and really quite perfect. Perfect fit, pockets are great for any size phone. Looks even better when you put it on.the fit is true to size and they are really soft and comfortable. At Heathyoga, we apply the principles and spirit of yoga to everything we do. When we launched yoga pants, we spent 3 years constantly testing different materials to choose the best, as well as collecting and analyzing our customers' feedback, from size, to style and quality. 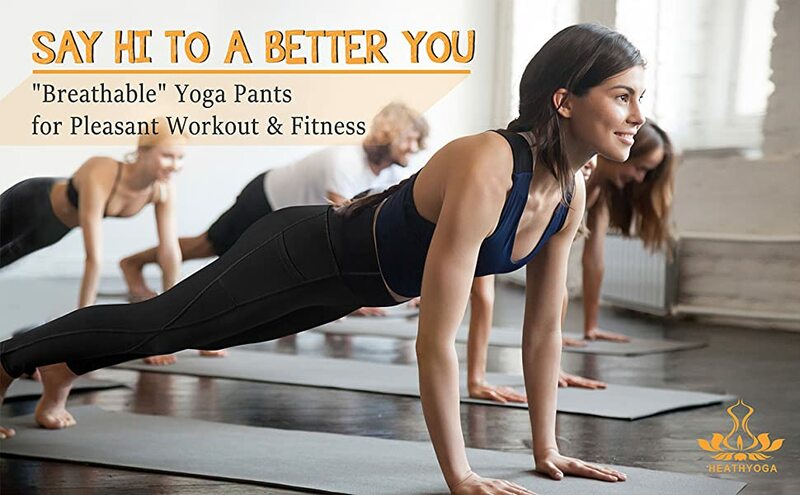 Now for yogis, these super-soft and moisture-wicking workout pants have become an essential part of their 100% yoga performance, relaxation & comfort. Give them a try, and we're sure you’ll experience the instant comfort that surprises the most skeptic testers. Large side pockets are designed to hold simple objects such as phone or keys, so that you can go wallet free. Interlock Seams for Maximum Comfort! 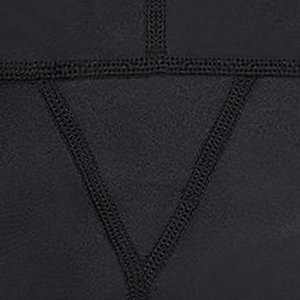 A gusset crotch is designed to maximize free movement, and interlock seams to reduce irritation and eliminate chafing, allowing for maximum comfort and wear-ability. Heathyoga yoga pants are non see-through! Heathyoga yoga pants passed the Squat Test. 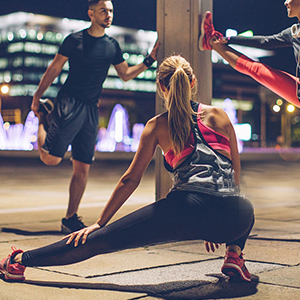 When you practise yoga, do deep squat in gym or other sport exercise and recreation, there is no need to worry about the see-through issue. The right yoga pants can make big difference between a pleasant workout and a frustrating experience. 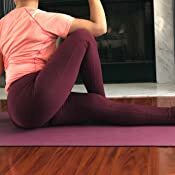 Can you move/stretch easily and freely on your yoga pants? 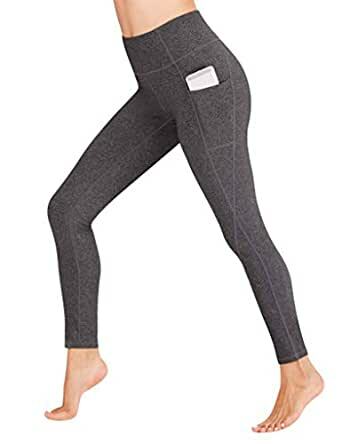 Made of soft 4-way stretchy fabrics, these yoga pants are very comfortable while being supportive at the same time, allowing for maximum flexibility during your exercise. The pants incorporate style and comfort, they hug your body and contour to your shape. Besides, the wide waistband holds them in place all the time no matter what poses you are doing. A good choice for fitness activities or just wearing around the house. How “breathable” are your yoga pants? Manufactured with premium breathable fabrics, these pants help to remove moisture from your body and dry quickly. Even when you are running and sweating a lot, you’ll always feel great! I absolutely love these yoga pants from the feel of the fabric, fit, color and functionality! I’ve used them for running, and working out. For my run and workout they stayed in place and I didn’t have that uncomfortable sweaty feeling because they were definitely breathable. 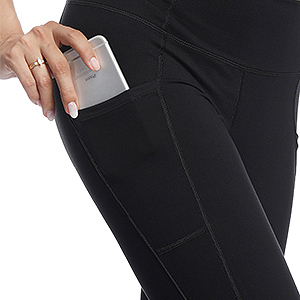 And for running around errands throughout your day the pockets are a plus so you can have your phone. As for working out I would say that your phone may stay inside your pocket if it’s nothing high intensity, I wouldn’t recommend putting your phone in the pockets for running though. I tested them out with few stretches and they have good flexibility. They’re also definitely squat proof, not see through at all. I definitely recommend these yoga pants, they’re great quality for their price, it can definitely compare to higher priced yoga pants! I tried about 20 pairs of leggings (different brands, style and color) in the past 3 years, enough for me to give feedback on this pair from Heathyoga. Most I own are $ 30, 40, or even 50. This pair just cost me less than $ 20, and seemed to have better quality. They are very figure flattering, and high waist. They do not ride down, or press into my belly. No matter how much I move around, these leggings stay put without having to adjust them every time I sit down or stand up. When I run, cycle and lift weights, I wore them without hesitation, since I couldn’t forget the next to skin comfortable feeling. Usually other brands pants are made of cotton and you will feel uncomfortable when sweat a lot. Well, these pants are totally different. I can’t say clearly how “breathable” these leggings are. With premium nylon material, they absorb the sweat so quickly, and what I feel is much comfort during my workout. More importantly, not see through at all! I don’t need to worry more when I do squats. Also, there are side pockets for phone and keys. Really amazing yoga pants. Thank you Heathyoga and Amazon for wonderful leggings at a great price! 5.0 out of 5 starsGreat yoga pants. these are the ones to get! These are the ones to get. They really are totally not see through, and my 14 year old daughter can even wear them to school. She loves these, as they stay put through the most vigorous dance rehearsals or PE (gym class), and don't sag anywhere. Cold water wash and line dry as instructed several times a week, as these are her go-to pants, and they still look brand new with no fading. The pocket holds her cell phone in place with no worries of it falling out even through gym class, as her school uses cell phones to track progress through stations in PE. I am comfortable as a parent sending her out the door in these, as the fabric is solid, no sheerness, and no visible underwear lines, which matters a lot when you have PE with 14 year old boys. We bought the space dye gray in size small. Gray is a nice heathered gray. Size small fits her perfectly, true to size. She is 5' 3" with size 25 waist and 34 hips at 108 pounds, if that helps you pick size. She does have extra long legs for height, and these are to just above the ankle bone on her so would probably be below ankle bone and hit just at top of foot on someone with average length legs. These are stretchy and soft without stretching out at all or losing shape. We bought a pair of Adidas leggings for three times the price of these at the same time and returned them, as they weren't nearly as nice, and she hated them and wanted more of these instead. Pros: I like the fabric, it feels smooth and won’t catch lint but thick enough so you won’t see-through. It’s not sheer. Cons: Runs a little large. There’s bunching around knees and ankles. The waistband is loose and doesn’t sit where it should. I am 5’2, 120lbs. You can see underwear bumps and seams. I recommend wearing seamless underwear with these. 11/10/18 UPDATE: I gave HeathYoga 5 stars because of their excellent customer service. They contacted me with my incorrect size concerns and promptly replaced my pants with a smaller size. Will update photo with new pants soon. Thank you! 5.0 out of 5 starsGreat Fit! Quality fabric! I love these pants and have now bought 4 pairs! The fit is great, not too tight, yet good support. I'm 5'2' so they're a little long, but I just cuff them. I've just washed all of them tonight as per their instruction inside out and in cold water, and hang to dry, so I'm hoping they're just as good after the first wash. Would definitely recommend!! UPDATE: Washed items came out perfectly - no shrinkage or pilling. I did wash them inside out as recommended. I love these yoga pants. They feel more like cotton than the slicker/shinier workout leggings, but they are very comfortable AND they have pockets. I also like how high-waisted they are. I have a really long torso and they still manage to reach my actual waist. The only small detail (which you can also see in their official photos) is the ankle width. It's a smidge wider than my actual ankle. Everywhere else is fitted, but the ankle is just an teensy bit flared. It's not a big deal. I've only had them a week, but I've already washed them and let them air dry. There was no difference in elasticity or shape. If they hold up this well over the next month, then I'll probably start buying these in bulk. 5.0 out of 5 stars2 Pockets and Not See Through! Large size was true fit on size 10, 5'8" height. Seriously loving these leggings. They are a slightly thicker and better quality material so nothing colorful is visible. The pockets are deep and on both legs and I placed a wide mini notebook to test the width and length. These are very comfortable and fit perfectly. I use them for work because I need comfy and flexible pants that don't need constant adjusting or a belt to make them fit right. With my job I sometimes need to sleep in them too and I hate sleeping in jeans.